Burzum is the solo project of Varg Vikernes (born Kristian Larsson Vikernes, AKA Greven Grishnackh/Count Grishnackh, currently legally named Varg Qisling Larsson Vikernes). The band was initially known as Uruk-Hai, Varg Vikernes' first band which he formed in 1988-89. He changed the name to Burzum (meaning "darkness" in Black Speech, the language of Mordor in Tolkien's The Lord of the Rings) in 1991 after the disbanding of Satanel, a band he founded with Abbath of Immortal. Burzum played a vital role, along with other Norwegian black metal bands such as Mayhem, Darkthrone, Emperor and Immortal, in the development of black metal as a musical genre and ideology. In particular, the ambient black metal and depressive black metal subgenres owe much to Burzum's sound. From his 1992 debut, Burzum, until his final black metal album, 1996's Filosofem, Burzum went from playing raw, primitive black metal to playing ambient, exclusively synthesizer-based music. His two most recent albums, 1997's Dauði Baldrs and 1999's Hliðskjálf, are purely dark ambient works recorded whilst in prison. However, they do not represent a complete departure from Burzum's previous works, as his albums always contained keyboard elements, and there were keyboard-only pieces on every album except Aske. 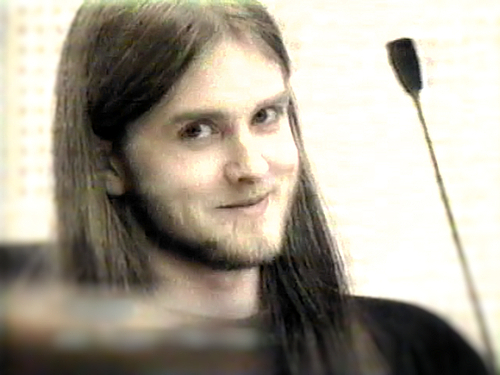 Throughout his career, Varg has managed to create and maintain a very distinct sound unique to Burzum. Burzum's lyrical themes are mostly concerned with anti-Christianity and Germanic paganism, and he has been credibly accused of neo-nazi sympathies, a position from which he has more recently distanced himself. While perhaps no longer explicitly pro National Socialist (Nazi), the themes and ideology of his work are of racial supremacy and eugenics. Due to his imprisonment for several church arsons and the murder of Euronymous of Mayhem, Vikernes has become one of the most notorious figures within the Norwegian black metal scene. Vikernes maintains that he killed Euronymous in an act of self-defense, and denies participation in the burning of three Norwegian stave churches. To read what Varg has to say about the origins of Burzum, '92/'93, and his own ideology as well as other matters concerning Burzum and Varg Vikernes, read his series of articles (A Burzum Story) at http://www.burzum.org/eng/library/, provided at the current official Burzum and Varg Vikernes website. In 2010 Burzum brought out a new album called Belus which style goes back to the earlier black metal style. What do you think about Burzum? Let us know in the comments below!